This Diamond Seed stitch dishcloth is a beautiful knit pattern, that gives a soft elegant touch to an otherwise dull cleaning cloth. Striking as featured home decor like a throw pillow. Find Diamond Seed Stitch Dishcloth On Ravelry! Thank you Lion Brand for sending me this 24/7 Cotton for the Knitted Kitchen 2017 Blog Hop! Love Crochet has Lion Brand Kitchen Cotton! Get It Here! Wool Warehouse has Lion Brand Kitchen Cotton! Get It Here! Due to the nature of this pattern – the yarn and needles used is only a suggestion and any substitute may be used. Size of finished product will vary depending on yarn and also size of needles used. This Diamond Seed Stitch version is worked over a multiple of 8 stitches, (plus 8 stitches for the border). You can choose to either do the Seed Stitch for the border if you are more comfortable and experienced with knitting – or if you are a beginner you can do a plain Knit Stitch border. NOTE: you will notice with each pattern repeat – the repeat is worked over an 8 stitch count! ROW 1: Knit until end. Optional Seed Stitch: P1; *K1; P1. Repeat from until end. ROW 2 – 5: Knit until end. Optional Seed Stitch: SL1; *K1; P1. Repeat from, until end. ROW 8 TO 21 forms the pattern and is repeated until size is reached. LAST 5 ROWS: Knit until end. Optional Seed Stitch: SL1; *K1; P1. Repeat from, until end. CHECK OUT AMERICAN CROCHET’S CROCHETED VERSION! 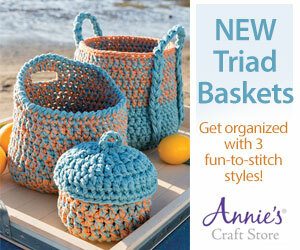 Sign up for our weekly Knitted Kitchen newsletter to get an email when a new pattern is released. You can join in by knitting the patterns as you have time. Share your progress and post pictures of your finished projects. Tag your projects and posts #knittedkitchen on all social media. Be sure to visit and follow the participating designers! Underground Crafter. Follow Marie through her weekly newsletter or on Craftsy | Facebook | Instagram | Pinterest | Ravelry | StumbleUpon | Twitter | YouTube. Creative Crochet Workshop. Follow Joanita on Facebook | Instagram | Pinterest | Ravelry | Twitter. Stitches ‘N’ Scraps. Follow Pia on Craftsy | Facebook | G+ | Instagram | Pinterest | Ravelry | Twitter. Craft Gossip: Knitting. Follow Sarah on Etsy | Facebook | G+ | Instagram | Pinterest | Ravelry | Twitter | YouTube. FOR THE FULL DETAILS AND SCHEDULE CLICK HERE!